My sister, Brady passed on May 10, 2008, less than a month after my book came out. She was 13 years old and became ill during the winter. Brady was my guide and teacher. She held the peace in our house and was always at ease. When I went ballistic over something simple Brady would sit ever so calmly while I acted like a complete idiot. I wrote about Brady in the book. We were both in need of a home when our moms found us in 1999. Brady came to live here first and I followed a couple of months later. We joined an older dog Abby who had been with my Mom in Santa Fe, New Mexico. She became our sister and was always “top dog.” She was a beautiful chessie and bigger than either of us. As soon as I arrived, she became my “big sis.” She taught me to “back off” and to understand there is a chain of command in our house. She would not stand for any pet free-for-alls. (I am still impaired in this area, but my Mom says I’m improving.) In 2000, we lost Abby Jean, who was 13. She did not feel well at the end, but she remained very much in charge. 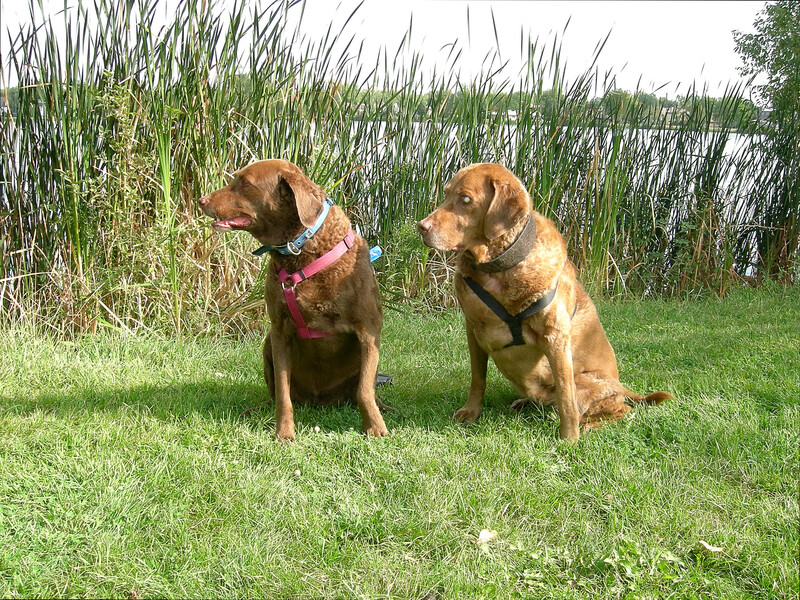 Brady, my Chesapeake sister, is now 13 years old. Years ago, her pet parents were getting a divorce, and she was one-step away from entering a shelter. My moms adopted her and gave her a “forever home.” Abby Jean was Brady’s guide. She taught Brady how to hold the peace, and Brady stills holds the peace every day. She is truly a love, a kind and gentle spirit who seldom gets distressed. When she moved in she had terrible allergies, and she scratched so much she didn’t have any hair left on her belly. She had a raunchy smell, and her knees and hips hurt. The vet suggested Mom give her back to her former parents, but Mom said, “No doggone way!” The vet had challenged my moms to work even harder for Brady. (It is not in either of my mom’s nature to give up on us.) My moms found an incredible homeopathic vet, Don Hamilton, DVM, who taught us a better way to treat Brady. He helped eliminate her allergies, and her soft belly hairs grew back. He also boosted Brady’s immune system and strengthened her knees and hind legs. He did this without using strong drugs or surgery. (Our moms always credit us furry ones for being their greatest teachers.) Brady lost her sight several years ago but she is still as sweet as ever. On that last day, I sat with Brady on and off while she slowly slipped away. I will always remember her gentle soul, her patience with me and her strong will. She was in charge after Abby passed and I did not always like that. I challenged her but in the end she always handled me and put me in my place. In those last hours, my moms and I sat with Brady. We held her and gave her all the love we could. I licked her nose and said good-bye. She left us so gently. Remember this big sis: I will always love you.